Bulky Household Waste - What Can & Can't Be Recycled? Home >> Green Living Tips >> Bulky Household Waste – What Can & Can’t Be Recycled? Bulky Household Waste – What Can & Can’t Be Recycled? Recycling is a good habit that we’re all trying to get in to on a regular basis, as the benefits for the world we live in are significant. However, despite all good intentions, the intricacies of recycling can be slightly off-putting – what can you recycle, what can’t you recycle and when it comes to the bigger items that can’t simply be folded up and squashed into a recycling container how does it all work? With larger, bulky household items there are several ways that you can recycle them. One of the easiest ways to recycle virtually any item that is in decent condition – and a way that will definitely net you the most profit – is to sell it. With the recession impacting all of us, the number of people who are looking for second hand goods has spiralled, and you can make money from disposing of old household goods, even if they are slightly damaged – or at the very least avoid having to pay the costs of having the goods taken away if the buyer will pick them up. The easiest way to recycle like this is to use an online auction site like EBay, or offer the goods for sale at a yard or car boot sale. If you’re not looking to recycle your goods to someone else, but you simply want to dispose of them then the definition of what can be recycled is usually quite wide. Items such as fridges, TVs, furniture such as tables and chairs, electronic appliances and fixtures, such as shelving units and cabinets, are all usually perfectly acceptable, regardless of the kind of condition that they are in. One option is to use a rubbish clearance firm like AnyJunk who offer a specialist bulky waste collection service. Most recycling centres won’t want to take anything dangerous so that’s where bulky household waste restrictions can kick in. Asbestos is not a substance that it is possible to recycle and it is also something that can be seriously hazardous to human health if any of the particles are inhaled. Small, older appliances such as toasters, coffee pots and crock pots may contain asbestos and if you are disposing of insulation or lagging then be sure this is not the asbestos containing type before trying to recycle it. If it does contain asbestos then the insulation should be removed and disposed of by a trained professional. As well as substances like asbestos, it’s not usually possible to recycle other potentially dangerous items, such as gas canisters, storage heaters, oil drums and any kind of builders’ waste. 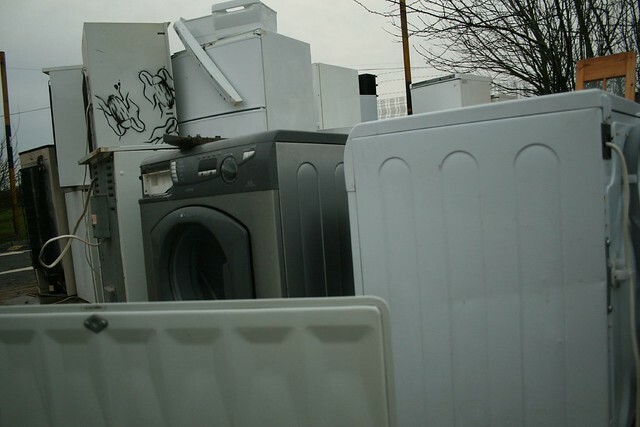 Most recycling plants and units also won’t accept fitted bathrooms or kitchens, and windows, window frames, doors and gates are also on the miss list (although you might find a second hand buyer to recycle these to if you advertise them). Finally, items such as vehicle parts and al fresco accessories like garden sheds, fences and greenhouses are not usually recyclable, although, again, you may be able to find a private buyer willing to take these off your hands to a new home. Whilst the recycling rules vary from location to location, these are some of the more general. If it all seems like too much effort to establish whether or not your items are recyclable, don’t be put off – the difference you will make to reducing landfill, emissions and energy consumption by doing this is helping to safeguard our future.